Sew Many Ways...: I'm Having A Sew Sew Saturday...Join Me Again? I'm Having A Sew Sew Saturday...Join Me Again? Last Saturday was my first "Sew Sew Saturday"...not a so so Saturday, but a Sew Sew!! I made an appointment with myself to get some something done and I did it. For me, Saturday seems to work the best. During the week, work gets in the way and night time I usually do my projects for my blog post, not to mention computer time for Pinterest and catching up on emails. This is why I love my new "Sew Sew Saturdays"
Today we are leaving bright and early for a road trip to see my nephew play soccer. However, I am still sewing something. I promised myself I would try to stick with this. 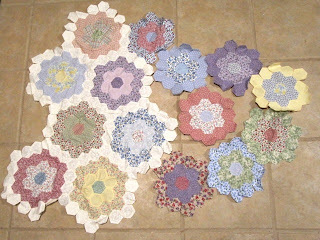 Here's what I dragged out of hiding...my Grandmother's Flower Garden quilt. I will do my hand sewing in the car. Need to take my Bonine though (motion sickness pill). That stuff works great for me. I can sew AND read in the car when I take that. I am hanging my head in shame on this one...I started this 10 years ago. My saving grace on this project is that I told my husband I would make him this quilt for our 50th wedding anniversary! Lol. 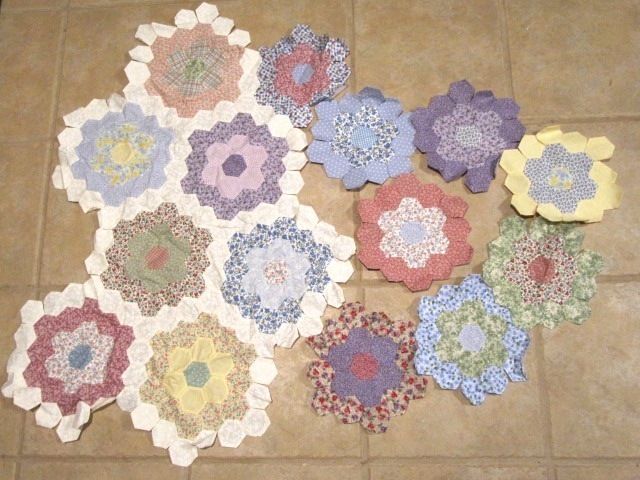 I also never told him what size the quilt will be...lap quilt, table runner, bath mat, place mat!!! Join me today for another "Sew Sew Saturday" and get out an unfinished project or start a new one, but just START SEWING!!! You have plenty of time.....lol. I'll join you for "Sew Sew Saturday". I'm doing some applique on a table runner. Hopefully it will be finished during the weekend. I hope to join you today! I actually changed my plans so I could stay home and sew! I am on a roll! I had a sew-sew week and it was fabulous. So glad to be out of the non-creative funk I had been in. EEWW! Back to sewing and creating. I have 2 volleyball games and it difficult to sew because seating is limited and I am not that young any longer but when I return WHAM straight for the sewing room. The room is a bit messy today but that is when I do my best work. I am a morning person when it comes to sewing and at night I like to do handwork. Your quilt already looks good! :) I like the Idea of a Sew Sew Saturday - I have a couple of projects that need finishing. Have a good weekend! I like that philosophy - give yourself a LOT of leeway - LOL! I'll have to try the Bonine for long car trips - reading and sewing make me sick in the car - bummer! I'll be sew-sew-sewing today too! oh karen, love your grandmother's flower garden! that's one of my someday quilts! yesterday I took off the frame an UFO that is about 12 years old!!! today I am sewing on the binding. so I will post a pic on my blog by monday or so. it feels so good to empty a space! yeah!!! now, to put another quilt on the frame very quickly! and yes it is another UFO. but this one is a year old. for my next grandchild coming next month! a little boy! #19. #20 will follow soon also, a girl! thanks for the incentive! Hello Karen, I'll be joining you today in a sew-sew project of my own! Making a lining for a thrift store find. Hope to post photos of the basket this week. Thank you again for hosting FaFF, I've made a few new friends already! Love that you are working the hexagons (GMFG)and strategically planning ahead for your 50th. Have a sew-sew Saturday! Saturdays are the best time for me to sew, too. Today, I am working on a Quilt of Valor. I have already started today. Sewed two notebook covers and I am about to start remaking a shower curtain and topper for the farmhouse bathroom! Having a great "sew sew" day! I'll be working on a 'strawberry' dress for my granddaughter who just turned four. It will be just like her mother's very favorite dress when she was the same age. I found the same exact strawberry print fabric five years ago (30 years after I made the first one!) and stuck it away for just in case there was a granddaughter. I still can't believe I just happened to be in the right store at the right time. Or that it had been re-issued. Yeah for finishing projects! I actually finished a baby dress I was making but after I got it done I hated it, so my new project was to take it out and make a new one. Which I just did! Yeah! LOL Karen on the 10 year thing! I have a skirt for myself I started 4 weeks ago. I couldn't get it fitted right, so it's been sitting for 2 weeks. Can't join you today, because I'm cleaning. :( And we have church at 4. Tomorrow will be my day. Good luck! It will be beautiful. No doubt you will have that project done before your 50th anniversary :) That's so funny. We all have projects that seem to take forever though. Your flowers look awesome. I just finished a cross stitch project that I've had for over 10 years. So, it can be done. Hope you had fun sewing during your trip and I think I'll have to try some of the motion sick meds you mentioned. As for me, I made today a sew sew saturday too and I had a GREAT time and was quite successful! Thanks for the inspiration! I had to laugh reading about the project for your husband. I have a similar story. A couple of years ago (four, to be precise) I was introduced to the Dear Jane quilt, loved it and bought the book with the intention to make one for my daughter. A quilt for her to take when leaving the house to live on her own ... FYI she is eight now ;-) I did think that I have given myself a generous timescale but you giving a totally new dimension to the word "generous"! Love the flowers ... and surprise, surprise also your craft room!